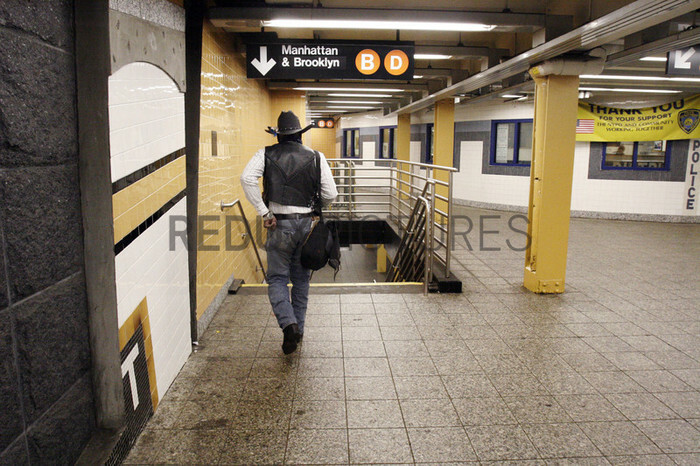 A Federation member makes his way through New York City to the ranch. The Federation of Black Cowboys is a nonprofit fraternal organization headquartered at a ranch straddling the Brooklyn- Queens line in New York City. As a 501(c)3 organization, they "seek to create greater understanding of African American culture and heritage" and "endeavor to provide educational opportunities for the young public of New York." There are around 35 Federation members, all committed to keeping alive the history of African Americans like Nat Love, Bill Pickett, and Stagecoach Mary Fields in the old West. Federation membership ranges from former insurance salesmen and city transit workers to former rodeo stars and rural transplants. Founded in 1994, the organization is headquartered at Cedar Lane Stables in Howard Beach, Queens. One of the ways in which the Federation engages with the community is through a Saturday program for at-risk youth. Each Saturday for an entire semester, a class of students is bussed to the ranch to attend mandatory educational sessions with topics ranging from respect and self-esteem to horse care and riding. Most of the program's participants have never seen a horse in person before, let alone touched or rode one.